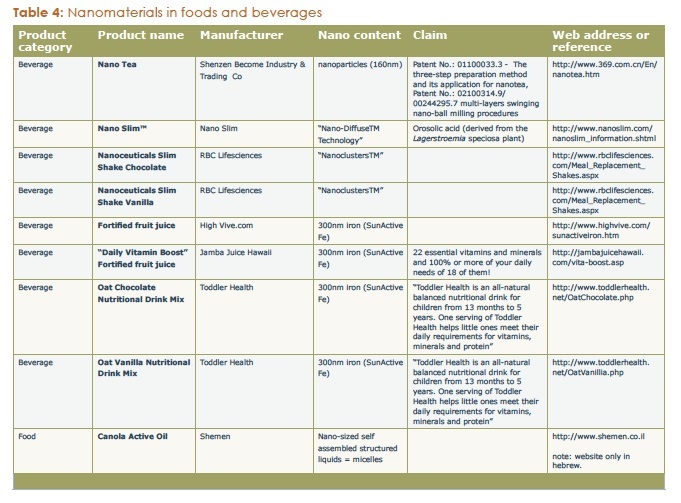 Friends of the Earth’s new report finds that untested nanotechnology is being used in more than 100 food products, food packaging and contact materials currently on the shelf, without warning or FDA testing . 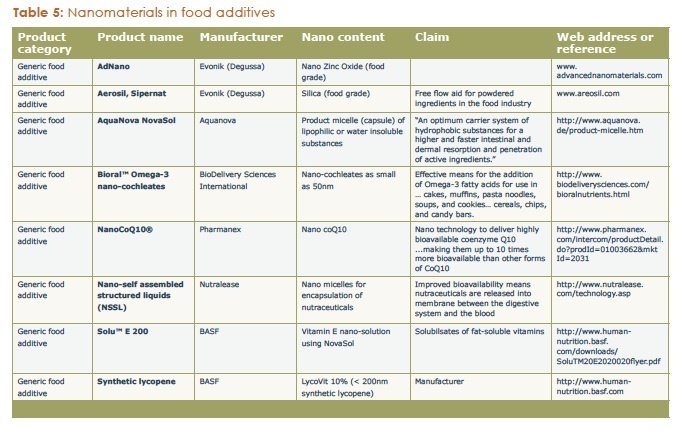 . .
‘Nanofood’ describes food which has been cultivated, produced, processed or packaged using nanotechnology techniques or tools, or food to which manufactured nanomaterials have been added. 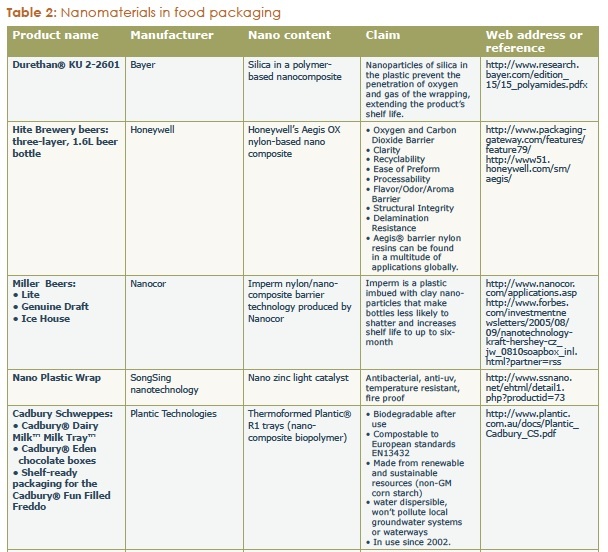 Nanomaterials can be used as more potent food colorings, flavorings and nutritional additives, antibacterial ingredients for food packaging, and more potent agrochemicals and fertilizers. For example, nanomaterials can be in the packaging around your crackers, provide the color of the meat you buy, and supply the added nutrients in the shake you feed to your toddler . . .
Nanomaterials are an untested new technology and not well researched. The long term repercussions of using them in our food are not known. Nanoparticles have been shown in preliminary studies to be more chemically reactive than larger particles and when they find their way into our bodies, they can potentially wreak havoc. We also don’t know how much we can safely ingest without harm, but we do know that some studies have already shown that nanomaterials can adversely affect our immune system . . . Exercise your rights as a citizen and petition elected officials to ban nanofood altogether. Your health, and the health of your children is at stake. Thanks to Meryn Stol, for pointing me to what could be a world changing enterprise for food sourcing. As reported in World Changing, The Food Map, a project from two graduate students from University of Wisconsin, Madison, aims to shed some light on the U.S. food network. Currently in a very raw form, Food Map is using the example of two brands of mac and cheese to demonstrate how it would work on a larger scale. It is time the shroud of secrecy surrounding what’s gone on with our food, be lifted. I personally support the idea of a travel log for every single food item that makes it into our grocery stores. Food Map would go a long way towards alleviating my concern regarding this most troubling statistic from the FDA, that only 1% of food imports undergo food safety inspection . . . Short of greater transparency, I have to resort to blanket decisions such as bypassing non US food altogether. And even so, I still leave myself open to risks with processed foods. Currently ingredient sourcing for processed food is not required. Please support The Food Map project, starting with a visit to the site. Too busy with the faltering economy, healthcare, global warming, and other pressing issues, U.S. legislators are putting food safety reforms on the backburner. That’s unfortunate, considering this recent statement from the Food and Drug Administration Science Board, that it can “no longer fulfill its mission without substantial and sustained additional appropriations.” I was shocked to learn that only 1% of most imported food gets inspected. Also, the current legislation does not require food manufacturers to disclose sourcing for ingredients used in processed foods. The implication is, unless sticking to natural, non processed, domestic foods, there is no way of knowing for sure what’s in our food. One casual comment made by a girlfriend during a recent dinner at my house, got me thinking, deep, about women, and food, and politics. “You mean, you made the crust? From scratch?” My friend could not believe I had spent the time, and thought I was “too much”. No big deal, I assured her, it had only taken me a few minutes to mix in the flour, salt and butter, and to roll the dough. That’s when I realized how far we have strayed from our womanly ways with food. Somewhere in the midst of first wave feminism, we, women made a bargain with the devil. Tired of being kept in the kitchen, we welcomed with open arms, promises from the food industry to make life more convenient for us. Put away your apron, and your pots and pans, we were told, and get out instead. Take your family to Mc Donald’s, for a complete dinner, or if you are courageous enough, go to the stores for some half baked alternatives. Pre-cut salads, frozen dinners, bottled dressing, whole roasted chicken, canned soups, cake mixes, potato flakes, . . . Open the package, mix it up and you are all set. That felt like progress, and the perfect solution for a hurried evening after a whole day at the office. Of course there were compromises to be made, such as paying more for our food, and jeopardizing our health and that of our family. Products loaded with too much salt, too much sugar, too much fat, and too many empty calories. Paragraph long labels with ingredients more fit for a science lab than our stomach. Foods purified from their natural vitamins and nutrition. Further compounding the problem, manufacturers conspired to confuse us with misleading claims that we were only too happy to believe. I know firsthand. I spent a good part of my early advertising career trying to convince moms of the wholesomeness of granola bars . . . what a spin that was! The truth has been catching up with us, however, in the form of record highs in obesity and associated illnesses such as diabetes, stroke, heart attack, and kidney failure. The personal and national costs are astronomical, and demand an overhaul of our entire food system, such as proposed by pioneers of the natural food movement. First was California food’s priestess, Alice Waters, then Omnivore Dilemma‘s Michael Pollan, and now Slow Food‘s Carlo Petrini. Each time, the green, intellectual elite has responded with ardor. Some of that enthusiasm has trickled down to the mainstream, as evidenced by the spread of organics in supermarkets. Deep down, though, not much has changed. Inspired from the success of Obama’s movement, I would like to suggest a different strategy, one that does not come from a few tenors, but that recognizes women as the beholders of the nurturing instinct, and the ones still in charge of most of the food decisions. Let’s call it The Women’s Food Movement, an effort at organizing the community of women all over, to help them regain confidence in their innate ability to nourish, using simple recipes and affordable, high quality, natural ingredients. Shifting the power away from manufacturers and retailers, back into the hands of women. No fancy words needed. Instead, a narrative anchored in their every day food activities and concerns, e.g. shopping for groceries, deciding on what to make for dinner, exchanging recipes, looking for deals and clipping coupons, worrying about feeding their family healthy food, having limited time for cooking, making ends meet . . . Most importantly, The Women’s Food Movement is about trusting women to hold the answers, collectively, and simply providing them with an organizing community and some tools to turn that knowledge into constructive action. This approach requires a deeper understanding of women’s food psychology, than currently displayed in existing solutions. For a beginning of food conversations with women, you may follow the Twitter stream here. With less money to spend every month, many Americans are turning to coupons to stretch their food budget. Last weekend, I decided to join the ranks, and sat down at my kitchen table, armed with scissors and the two inserts from our Sunday paper. And started clipping away. If I had any lingering doubts about the intentions of the food industry as a whole, this little exercise put them to rest. 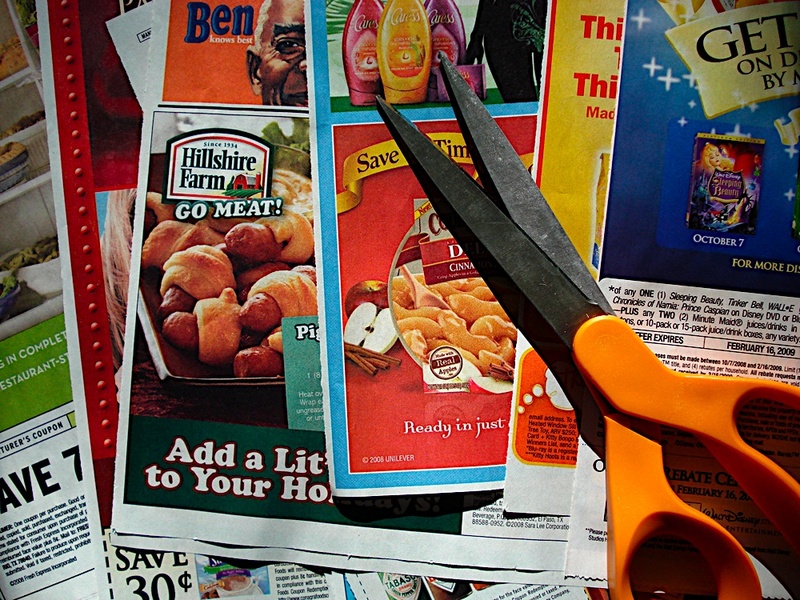 Coupons were not created with the interest of consumers in mind. Rather they are yet another marketing tactic from consumer packaged goods manufacturers to push their highly processed foods, regardless of their actual health benefit or lack thereof. I say, let us not fall into the coupon trap, and seek instead, other, smarter ways to save, that won’t hurt our health. 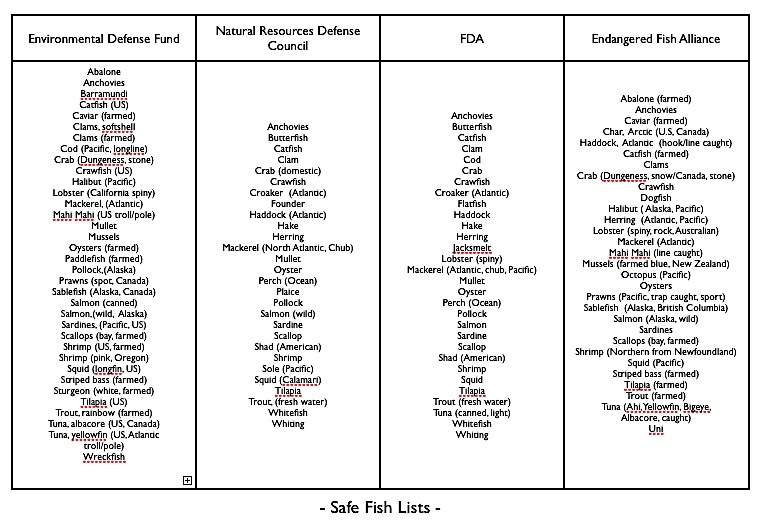 To be safe, I guess I will just stick to the ones they all agree on: anchovies, catfish (farmed), clams (farmed), crab (Dungeness), crawfish (domestic), mackerel (Atlantic), oysters (farmed), salmon (wild, Alaska), sardines (Pacific, domestic), scallops (bay, farmed), squid (Pacific, domestic), tilapia (farmed, domestic), trout (fresh water, farmed).